What kinds of theoretical insights have emerged from the anthropology of development? What can anthropologists learn from development work? Anthropology Through Development: Putting Development Practice into Theory is the topic of the new issue of the open access journal Anthropology Matters that was released a few days ago. This issue, edited by Amy Pollard and Alice Street, consists of four interesting articles. (A)nthropological theory, drawing on Western European philosophy and political history, appears focused on strong governments, highlighting the potential dangers of excessive government, rather than the challenges of weak government. Detailed ethnographies of the development encounter, including those undertaken by development practitioners themselves, can provide a foundation for building new theory to address contemporary issues, such as those faced by governments and the governed living in ‘weak and fragile states’. Such studies can enrich our understanding of development processes, while helping to bridge the gap between ‘applied’ and ‘theoretical’ anthropology. Reconstruction efforts after the tsunami is the topic of Sonia Fèvres paper Development ethnography and the limits of practice: a case study of life stories from Aceh, Indonesia. Development anthropology has an important part to play in contributing to the design and evaluation of humanitarian aid, she explains. Ethnographers should in her view not limit themselves to a meta-analysis of the development framework itself, or the anthropology of development. Antonie L. Kraemer explains in Telling Us your Hopes: Ethnographic lessons from a communications for development project in Madagascar why it might be a good idea to turn informants into ethnographers. It might be fruitful to read her article together with Chris Campregher’s text Development and anthropological fieldwork: Towards a symmetrical anthropology of inter-cultural relations. Here he questions popular assumptions about “voiceless people” and asks: Do they really need our help? The interesting question that STS poses to us as anthropologists is the following: STS scholars state that they need to treat science and its outcomes (“scientific facts”) with the same methodological scrutiny that they use to explain “wrong” statements. So, how can development agents and anthropologists continue to differentiate between scientifically legitimized “knowledge” and culturally constrained “beliefs” of local communities? Democraticize scholarship! Happy Open Access Week! Let’s celebrate and promote open access to academic research! It’s Open Access Week! There hasn’t been much publicity around this event here in Norway, not in the anthro-blogosphere either. So, to start with, here some videos! Here’s a quick, simple and funny introduction to the concept of open access in universities by the Canadian Association of Research Libraries and McGill University Library. The London School Economics has made a nice contribution - the Open Access Week awards. One of the awards went to anthropologist Deborah James. She has written the most downloaded book chapter in 2009/10: ‘I dress in this fashion’ transformations in sotho dress and women’s lives in a Sekhukhuneland village, South Africa (1996). The lucky winner of The Departmental award for most improved full text deposit is the Department of International Development, who saw an increase from less than 3 full text open access papers per member of staff in 2008/09, up to 8 per member of staff in 2009/10. The London School of Economics has an impressive number of anthropology publications in its online repository, but most of them cannot be downloaded, and open access articles are not highlighted. Book review: Religious globalization = Engaged cosmopolitanism? Can studying religious movements give us new insights into globalisation or even cosmopolitanism? Anthropologist Tulasi Srinivas thinks so. Antropologi.info book reviewer Tereza Kuldova has taken a closer look at Srinivas’ new book Winged Faith: Rethinking Globalization and Religious Pluralism Through the Sathya Sai Movement. 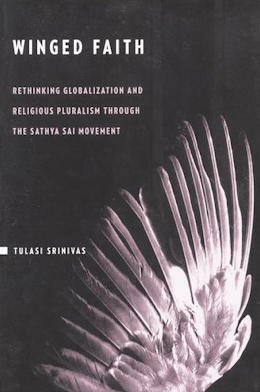 Tulasi Srinivas draws us with her book into the intriguing world of a transnational religious Sathya Sai movement, a movement that crosses regional, national, religious and cultural boundaries and thus creates something that she labels ‘engaged cosmopolitanism’. Through the focus on this religious and cultural movement that has its roots in India and that has managed to grow into a huge global movement with millions of followers and devotees, she tries to resolve what ‘cultural globalization’ might mean in contemporary world. At the same time, she addresses the questions of the nature of transglobal economies of spirituality, affect and religio-cultural identity and the meanings and forms of new pluralism, as they can be exemplified through this movement. Her detailed ethnographic study based on nine years of fieldwork, makes it clear that processes of globalization cannot be perceived in terms of westernization, as some would like to have it. They must be understood in terms of interactions, flows and movement between variously localized cultural centers and in terms of the resulting variously spatially and culturally localized translations of these interactions, images, ideas and discourses. To put it simply, flows are multidirectional (though I would say, this has never been different). Tulasi Srinivas is throughout her work making an appealing argument for a ‘dynamic ethnography’, which operates with the concepts of mobile description and multi-sitedness. The problem she tries to resolve in her writing is how to comprehend mobility and how to deal with translocal phenomena and that within a discipline so ill equipped to understand them. Hers is a critical hermeneutic study of religious globalization, where concepts such as complexity, relationality, networks, interaction and affectivity play a crucial role. Even though this type of logic is generally appealing and without any doubt trendy, there is still something that disturbs me in her work. It might be the constant concern with ‘cultural globalization’ and ‘cultural translation’, even after reading the book I still find myself wondering what exactly does that mean, where does one culture begin and the other end, what is borrowed, what authentic, what reinterpreted? Maybe we are just looking here for artificial isles of safety in a sea of constant flux… The question is - can we not do without these isles? Let me now provide you with a brief sketch of the book and then discuss one of the chapters in more detail. Throughout her book, Tulasi Srinivas introduces us to the story of the Sathya Sai movement. This movement is sixty-five years old and draws on a Hindu-Muslim culture of saints and mystics and on several strands of religion in the subcontinent, from Sufi mysticism, popular Hinduism, and Buddhism to indigenous healing rituals, Zoroastrianism and contemporary Christian teaching. The movement is centered on the charismatic personality of Shri Sathya Sai Baba (b. 1926). Sai Baba was born in a remote village of Puttaparthi in Andhra Pradesh and “after suffering a series of seizures and falling into trances, he declared his greatness at the age of thirteen and proclaimed that he was Sai Baba, a reincarnation of Shirdi Sai Baba, a Muslim saint from Mahara who had died in 1918” (p. 9). He substantiated his claims by performing miraculous acts, such as materializations of sacred ash that devotees apply on their foreheads. These materializations continue to be central to his practice and are a matter of dispute among the members of anti-Sai movement. Tulasi Srinivas maps the way this movement of his following has grown and became popular with people all around the world. She devotes a part of the book to the discussion of the nature of contemporary spiritual travel to the ashram in the village of Puttaparthi and the viewing and experience and magical encounter of darshan (witnessing of divinity) of Sai Baba. She takes us into the world of the global Sai community that stretches from the village of Puttaparthi to Tokyo, London, Hollywood, Mumbai, Bangalore and many other places around the globe and tries to grasp what it means to be and become a part of this global Sai community. The chapter 4 is noteworthy because of its controversial nature. Tulasi Srinivas poses here the questions considering democracy, transparency and theology within the Sathya Sai Organization and focuses on the discussion of the allegations of ‘sexual healing’ and the ‘strategies of secrecy’ that according to her pervade this organization. 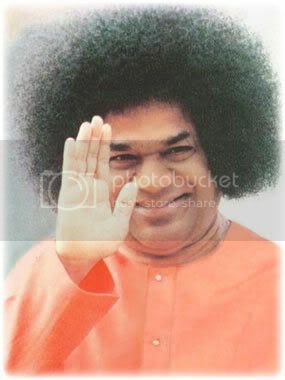 In this respect, it is instrumental to read the reactions of the Sathya Sai Organization to her book, and in particularly to this chapter on http://www.saisathyasai.com/tulasi-srinivas/. This controversy might be of interest to anyone possessing deeper knowledge of the movement and studying it, and it is up to the reader to make any conclusions. However, such critical comments are possibly the result of the fact that Srinivas dared to include the perceptions and views of the anti-Sai movement and did not only restrict her ethnography to the experiences of the committed devotees. On the other hand, how accurate any of the data is, is very hard to judge for anyone outside the movement and without its deep knowledge. Further, she includes an interesting discussion on the encoded bodily prescriptions in the ashram and the problems they pose to the devotees from different cultures. She understands the failure of certain devotees to abide by the ashram rules as illuminating the “differential understanding of embodiment, salvation, desire and discipline” and believes that it speaks to “problems in cultural translation” (p. 19). However, the most intriguing chapter is according to me, being keenly interested in material culture, the last one dealing with the paradoxes of the teaching of resistance to the material world on one hand and the excessive consumption of religious objects on the other. In this context, “the material object is rejected as ‘unreal’ and a distraction from the truth of divinity, but the objects themselves become a significant signpost indicating the road to self-transformation” (p. 290). Tulasi Srinivas shows us nicely how the consumption of these religious objects, be it gifted sacra or bought ephemera, has the power to directly transform the selves and the habitus of the devotees. The gifted materializations (rings, necklaces, talismans, sacred ash, ambrosia etc.) from Sathya Sai Baba are the most important of the religious objects. “The reception of a materialized object instantly raises one’s standing among the community of devotees, as it is read as a sign of divine favor and an index of one’s active piety” (p. 285). The materialized objects gifted by Sai Baba are believed to be transformed by the contact with him and thus possess a magical transformative power within them, “capable of transforming people’s bodies and minds from sick to well and from skeptical to devotional” (p. 294). “The gifting of the materialized objects to the faithful is the key element of transformative interaction between deity and devotee, as it is believed to be the material form of the much hoped for transference of the divinity’s grace and power as a blessing to the devotee” (p. 297). Though gifts are the most important religious items for the Sai devotees, most of them never meet Sai Baba and are thus dependent on the global distributive network of Sai Baba goods, that can be purchased almost anywhere in the world. However, the further from the village of Puttaparthi, the less ‘authentic’ and powerful these objects get. This chapter thus draws us also into the world of branding of religious goods, and the branding of the movement as such. What began as small business in touristic souvenirs in the 60s was turned into a bigger business in religious souvenirs in the early 70s mostly for spiritual tourists. By the beginning of 80s a huge business in religious objects of international scale, dealing in all kinds of objects, ranging from images, photographs, CDs, books, to jewelry, all featuring Sai Baba, was in place. After all, the “Sathya Sai movement is known to be the largest faith-based foreign exchange earner for India, earning approximately Indian Rs. 881,8 million (approx. $5 million) for the year 2002-2003” (p. 12). Srinivas draws us also into the intricacies of the trade in the Sai Baba goods, where the SSSO claims to be the only ‘authentic’ source of ‘blessed’ goods by Sai Baba and where the struggle for perfection of the purchased goods is central. Engaged cosmopolitanism or Hindu superiority? To conclude, we can contrast the idea of ‘engaged cosmopolitanism’ which Srinivas uses with a statement of one of my informants, a lady who has been a spiritual tourist for the last 20 years and managed to escape her obsession: “After seeing all these babas and the way they treat people, you realize that most of what is happening is about power and money, the one who gives most gets those materialized gifts, the one who pays most gets to sit next to Sai Baba, in the end it is only a huge money-making industry and highly hierarchical one. And what is worse, the whole agenda of this money-making business is not a peaceful message of acceptance and equality of all religious beliefs, but rather the opposite, namely the superiority of Hindu thought and the Hindu dominance in a global sphere, after all India is shining. And magic, they can do no magic, why don’t they treat the lepers waiting outside their ashrams?” (Interview, 18. august 2010). Engaged cosmopolitanism? Depends on what you imagine under this term. This book on its all appears to be well-researched and is without doubt well-written, though at times it might seem too chaotic and the arguments unnecessarily literally twisted. A struggle for more clarity would be advisable. That does not diminish the contribution of the author to the studies in transnational religious phenomena. The book would be of interest to any scholar or student of globalization, religious movements, India, and to anyone interested in the methodological challenges posed by multi-sited fieldwork. And I would say, it is a must read for any Sathya Sai devotee! Theology's turn to Ethnography: New OA journal "Practical Matters"
I’ve stumpled upon a rather new Open Access Journal called Practical Matters. This publication of Emory University is both interdisciplinary and “intermedia", i.e. multimedia. 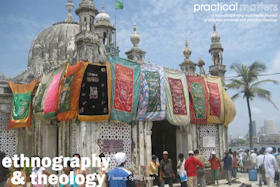 The most recent issue (nr 3) is called Ethnography & Theology. Many scholars of religion who did not begin their scholarly careers as anthropologists now count themselves ethnographers, or at least state that they employ ethnographic methods. This issue aims to push forward the interdisciplinary conversation around the intersections of ethnography and theology. This issue includes a 12 minutes video by Melissa D. Browning about theologists on fieldwork with a corresponding paper Listening to Experience, Looking Towards Flourishing. Ethnography as a Global Feminist Theo/Ethical Praxis. Issue 2 focuses on youth and includes an twelve-minute documentary by Sonia Narang that examines how the practice of the visual arts can involve the religious identities of young people. In the first issue (topic: imagination), you’ll find a lot of photography, for example Imagining Antarctica by Sandra F. Selby or Luther’s Wedding: How One Town is Rebuilding its Convivial Culture through Imagination and Tradition by Barry Stephenson. The limitation of people’s freedom of movement based on their nationality (“global apartheid”) is maybe one of the biggest human rights issues nowadays. One month ago I wrote about Shahram Khosravi’s auto-ethnography of illegalised border crossing. 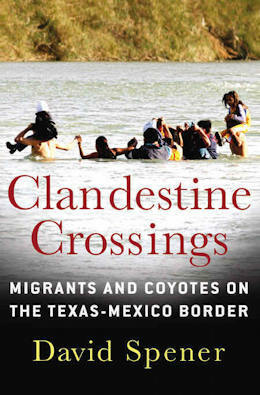 The Democracy In America blog at the Economist draws attention to a related book: Migrants and Coyotes on the Texas-Mexico Border by David Spener. The anthropologist spent eight years doing field work on both sides of the border. Armed with latest technology, the U.S. does everything to prevent people from the South to enter its territory. Because border crossing is difficult, 90% of all illegalised migrants crossing into the United States through Mexico hired a smuggler (also called “coyote"). Human smuggling has become a $6.6-billion industry in Mexico. The press presents human smuggling as a sinister organized-crime phenomenon. Spener argues that it is better understood “as the resistance of working-class Mexicans to an economic model and set of immigration policies in North America that increasingly resemble an apartheid system. Publishing a book is not always the best strategy to spread knowledge. Therefore it is a good idea to set up companion websites as Spener has done. Here we find border crossing stories, articles and papers as well as images, maps and sounds. As the Democracy in America blog reminds us: Even reaching the border is hard. Each year some 20,000 migrants are kidnapped for ransom in Mexico. Victims are made to give the phone numbers of relatives, who must pay upwards of $3,000 or more to get them released. Illegal in Mexico, they must evade checkpoints throughout the country and risk deportation if they report a crime. Women and girls—about a fifth of the migrants making their way through Mexico—face additional dangers. Six out of ten are reckoned to suffer sexual abuse during their migration, according to Amnesty International, a human-rights watchdog. A bit more than two weeks ago, around 1300 anthropologists from all over Europe left the university village Maynooth not far away from Dublin. Europe’s largest anthropology conference, the biennial congress of The European Association of Social Anthropologists (EASA) was over. As usual, hardly any information about the knowledge that was exchanged at the conference, found its way to the public. Eoin O’Mahony, geographer at Maynooth, sums up the opening keynote lecture by one of the most famous anthropologists around - Talal Asad. “As far as I can tell", he writes, “the lecture laid out the ground for a new anthropology of terrorism and human rights". Talal Asad “mapped out the economy of liberal human rights where the reorientation of the concept of ‘just war’ made certain peoples’ deaths necessary to safeguard the lives of others". Asad’s paper, which his speech is based on, is available online (pdf - download it before they remove it!). Or check also an earlier post Selected quotes from “On Suicide Bombing” by Talal Asad. Philipp Budka (University of Vienna) is the only one who has written a report about the conference. It focuses on workshops that deal with media (technology). Several bloggers are among the paper givers, for example John Postill, Alexander Knorr and Gabriella Coleman (who blogged a little bit about her Ireland trip). Stéphane Voell, blogger at Traditional Law in Georgia, is wondering if it was worth organizing a workshop after not more that seven or eight people showed up. It reminded him on the days when he as a 17 year old was playing in his school band (Text in German only). The more anthropology (or other academic genres) I engage in during a 3-4 days period, the more engaging it gets. Listening to debates and commenting on papers during the day, and discussing, chatting and mingling during the night, with too little sleep in-between high-wire the brain in a very creative and inspiring fashion. The first time I experienced it, weeklong camping on rock festivals was still fresh in my memory, and that experience was what an anthropology conference reminded me of. Are there some blog posts I haven’t seen? 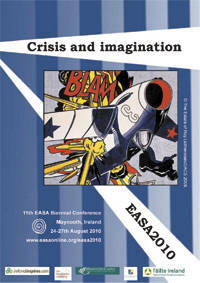 Something about EASA 2010 you want to share? Anthropology and the World: What has happened at the EASA conference (2006)? “What if they gave a war and nobody came?” is a popular slogan from the antiwar-movement. But nowadays, when USA with their allies go to war in Iraq and Afghanistan, people do come. Lots of people enlist in the military, even voluntarily, especially in the U.S. Why? Anthropologist Sarah Salameh answers this question in her master’s thesis Courtesy Of The Red, White And Blue. A Midwest American Perspective on Troops, War and Nation. And it is indeed an interesting and well written thesis about “one of the most understudied groups": white middle-class Americans. The many settings the reader is introduced to includes an Army recruiting office, a public elementary school, Memorial Day celebrations, the motorcycle group the Patriot Guard Riders‟ missions, and the celebration of a National Guard unit returning home from Iraq. One gets to know people ranging from Army recruiters to the girls they helped enlisting at the age of 17, the concerned mother of a soldier, and a bunch of rather unconcerned 5th graders performing their patriotic duty decorating their town‟s cemetery with Star Spangled Banners. One of her findings is the critical distance many soldiers have towards the government. The official reason for waging a war is not always relevant for the soldiers. Looking at peoples‟ motives for joining the military, Salameh writes, “underlines the irrelevance of government and politics". 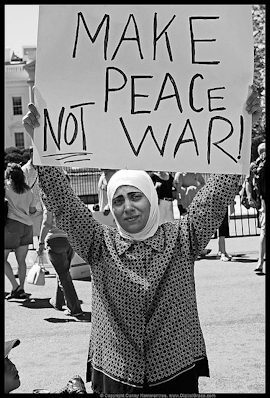 Not one person she’s talked to (around 100) claimed to have joined the military because he or she thinks that this or that exact war is especially just or necessary as it is explained by politicians. Robert is one of them. He did not believe the official explanation of the Iraq war (weapons of mass destructions). At times, Robert claimed the Iraq war is a quest for oil. I am going for other reasons than oil. When I was in Iraq, I built schools, and handed out backpacks and paper to school children. I fixed dams so the people could have electricity. I spent two years totally committed to doing stuff like that. The research subjects explained and mostly legitimized the US military presence and their own participation, with a reference to themselves as Americans. Robert places American politicians outside these “American people. He places himself, as a service member, on the side of and fighting for, the American people, not the government. People and troops, the government and the people make up two societies that act according to two different value systems; the politicians according to a rather crooked one, initiating wars on unjust premises and ignoring the will of the American people; the American people according to what might perhaps be termed a more American one, expressed in Robert‟s account as focused on a wish to keep his own family and other Americans safe and free, and help Iraqis towards a better life. Help Iraqis towards a better life? That’s in the eyes of the soldiers their responsibility as Americans. The USA is in their view a positive example for other countries, an example to follow. It seems to me they are on a kind of religious mission. Much of the (…) USA and its military, can be understood within the context of civil religion, wherein the nation is the focus of belief, and its endeavours overseas is the spreading (missionary function) of the values inherent in the „national belief‟. This is connected to the story of the American foundation, taking the form of myth, where today‟s American‟s ancestors came to this promised land and made a covenant with it, still binding today‟s Americans. The covenant has two aspects: to maintain the concept of promised land, basically to keep the USA free, as underlined by for example Robert, as well as to „export by example‟ the American version of freedom. 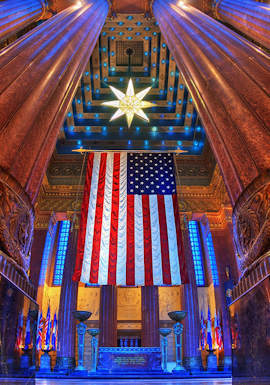 Indianapolis War Memorial Shrine Room. She also describes the flag as totem, and blood sacrifice as an American group taboo. At Memorial Day sacrifice was a central theme. “What soldiers in the Army do is to give up their life for others‟ freedom", an army recruiter explained. Tony‟s 5th graders stood up, faced the flag on the left side of the blackboard, put their right hand on the left side of their chest and said the Pledge simultaneously with the principal‟s voice. Everybody knew the Pledge by heart and said it out loud: I pledge allegiance to the flag of the United States of America and to the republic for which it stands: one nation under God, indivisible, with liberty and justice for all. But do people in Iraq and Afghanistan really want their help? What about the widespread opposition towards the US wars? This question is not very relevant for the research subjects. Even if the the people the USA tries to help reject the help, the USA‟s efforts are legitimate. “It is as if the people on the receiving side of, what by the Americans is presented as „help‟, are not in a position to judge whether what the US presence offers is good or bad", Salameh comments. This remembers of what Edward Said describes as orientalism. People in the Orient have frequently been portrayed as more passionate, more violent and barbaric, as well as culturally determined. This „savaging‟ of the Orientals has justified European and American imperialism throughout history, often presented as a civilizing project. And in the very same act as „the West‟ thus diagnoses other countries as less developed, „the West‟ also categorizes them as passive (they are weak, ill), thus allowing for a paternal role. There is the „good Other‟ who takes the form of some sort of deprived, but possible, allied and member of the „free world‟; in the accounts above termed „innocents‟, „civilians‟, „the people‟ (of Afghanistan and Iraq), or simply „Afghanis‟ and „Iraqis‟. Opposed to this, exists a „bad Other‟ that cannot possibly be helped, thus only fought. This bad Other carries many different names, among them „terrorists‟, „insurgents‟, „extremists‟, „radicals‟, and to a varying degree also the Iraqi and Afghani „leaders‟ and „government‟ are included. Although nationalism is important, she stresses that she does not claim it is the only, or the most central factor. There are many individual factors (escaping from smalltown life etc). Economic incentives are often central when people decide to join the military in the first place, and “a thesis could have been written on economy as incentive alone"". Sarah Salameh is currently turning the thesis into a book where she will include on all those other factors as well (see my short email interview with her, Norwegian only). The whole thesis is available online. War in Iraq: Why are anthropologists so silent?